I hereby dub this the Portland Smoothie. Not so much for what’s in it, but for the directions on how to make it. This came out of a fascinating discovery I made this weekend. If you really like pulpy orange juice like I do, the best way to go is to get a navel orange (they don’t have seeds), peel it, then toss it in the blender. No water needed. Pulptastic, pulptacular, and since citrus is just finishing up its season, delicious and wonderful. Then I cleaned out the freezer and found some frozen berries in the back and in trying to figure out what to do with them, said to myself, OH HEY BLENDER! Blender. Regular ol’, not fancy Vitamix or Blendtec, $29.95 from Fred Meyers blender. Peel the orange. Toss it in the blender. 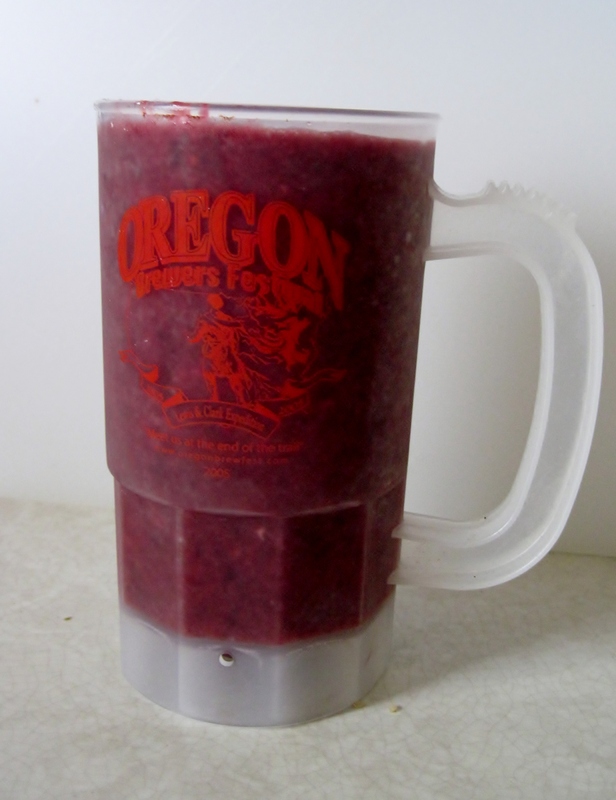 Fill the Beer Festival Mug with frozen blackberries to the taster line. Toss in three or four frozen strawberries. Fill with water to the taster line. Toss whole lot into the blender. Put lid on top of blender securely. Just sayin’. Blend. Mine seems to come out perfectly after 45 seconds on ‘Liquefy’. Pour blended concoction into Beer Festival Mug. It should fit perfectly with about 1/8th of an inch of space on the top, as in photo illustration which is my kitchen counter and the cutting board propped against the wall. WOO FANCY FOOD PHOTOGRAPHY!